Maine Boats, Homes & Harbors - Frequently Asked Questions & Digital Edition Info. Welcome to the digital edition of Maine Boats Homes & Harbors magazine! Read on to learn how you can enjoy your favorite magazine from anywhere (well, almost) on Earth. Why go digital? Our readers love it because it looks great and features exclusive bonus content. Our "snowbirds" love it because they can always access the magazine, no matter where they roam. Our friends outside the U.S. love it because they can read the magazine sooner. How do you love it? Let us know! Q: Who can get a digital subscription to Maine Boats, Homes & Harbors? A: Any of our current subscribers to the print magazine can access the digital edition for free. If you'd like to subscribe to the print edition you can do so through our website or by calling our subscription services at 1-800-710-9368. Digital-only subscriptions are available through iTunes, Google Play, or our website. Subscribers who've signed up through Maine, Boats, Homes & Harbors, and selected "Digital Only" or "Print + Digital" delivery options have access to the digital edition and will be notified via email or push notification of an available issue. Subscribers who wish to receive the print edition will receive each issue at the mailing address listed on their account. Q: How can I view the digital magazine? A: You can download the Maine Boats, Homes & Harbors digital edition on your iPhone, iPad, or Andriod device using the Maine Boats, Homes & Harbors app. You can also view the magazine on any desktop or laptop with internet connection here. Q: Is the app available for Kindle or Nook? A: We do not currently have an app for the Kindle, and although Maine Boats, Homes & Harbors is available in the Google Play store, it may not be compatible with other devices like the Nook. A: If you have questions regarding a subscription to Maine Boats, Homes & Harbors, or questions about the digital issue, please contact us here. Q: How can I subscribe to Maine, Boats, Homes & Harbors? contact our Rockland, Maine, offices at 207-594-8622, Monday through Friday, 9 AM to 5 PM EST. Q: How can I check the status of my subscription? A: Please call our toll-free subscription service at 1-800-710-9368, or send an email to customer service. A: Please visit our customer service site, select "Change of Address" from the menu, and follow the instructions on the page. Please note that it may take up to two weeks for the change to take effect, so if you're moving to a seasonal address, be sure to submit the form a few weeks before you go. You can also call our toll-free subscription service at 1-800-710-9368 to create an automatic seasonal address update. If you're still unsure about locating your account number, please contact us at 1-800-710-9368 or send an email to customer service. Q: I've moved and I haven't received my issues / I'm missing issues! A: Our magazine currently mails 3rd class/Standard Post. This means that the Post Office will not forward the magazine to your new or seasonal address. To change your mailing address with us, please visit our customer service site and follow the instructions on the "Change of Address" page. Please note that it may take up to two weeks for the change to take effect. You can also call our toll-free subscription service at 1-800-710-9368. To add a seasonal mailing address (which updates automatically) to your account, please contact us by email or call 1-800-710-9368. To request missing issues, please use our online contact form. Q: I haven't seen an issue in a while, am I missing something? Where is it? Each issue should arrive in your inbox/mailbox the week before the cover date (or shortly thereafter) at the email and/or mailing address listed on your account. PLEASE BE SURE that we have your correct email/mailing address on file, including any floor, suite, or apartment numbers. Q: I ordered my subscription a while ago - where's my magazine? entering an incomplete address (e.g. omitting an apartment, suite, floor or box number). If you have any questions about the status of your order, please call our toll-free number: 1-800-710-9368. Q: I ordered online but my credit card was never charged; did my order go through? A: If you order your subscription using our online order form, you will receive a Confirmation Page once your order is submitted. Please print and retain that page for your records. If you do not receive a confirmation, it is most likely that your order did not go through. Please be sure that, when ordering online, you complete all the required fields in the order form. Do not use your browser's "back" button during the ordering process. That can cause your order to be deleted. Q: I paid by credit card; when will it be processed? Q: I just got an email from an address I don't recognize; is this legit? A: Maine Boats, Homes & Harbors communicates with our subscribers in a variety of ways, including emails sent from our main office and our Customer Service center. Emails sent from "___@ maineboats.com" or "maine.boats @ fulcoinc.com" or "custsvc_meboats @ fulcoinc.com" are legitimate. If, however, you are unsure, please don't hesitate to contact us before opening any email. You can turn off email notifications or change these settings any time by calling our toll-free number (1-800-710-9368), visiting our Customer Service website, or sending us an email. We will also send out e-newsletters, special event notifications, and digital issue notifications through a 3rd-party email delivery service. To ensure you get these emails, please add " @e2ma.net " to your safe-senders list. You can always customize your email preferences or opt-out from these emails. Q: Can I get back issues? A: Your username is the email address you registered with us. Your password is your seven-digit account number that appears on your magazine's mailing label between the hashtags (#) above your name and address. If you are unsure of your account number, please contact us at 1-800-710-9368 or via email. Be sure to include your name and mailing address in your request. Q: Can I order a digital-only subscription, without getting the print magazine? A: Yes. Digital-only subscriptions are currently available through iTunes, Google Play, or our website. 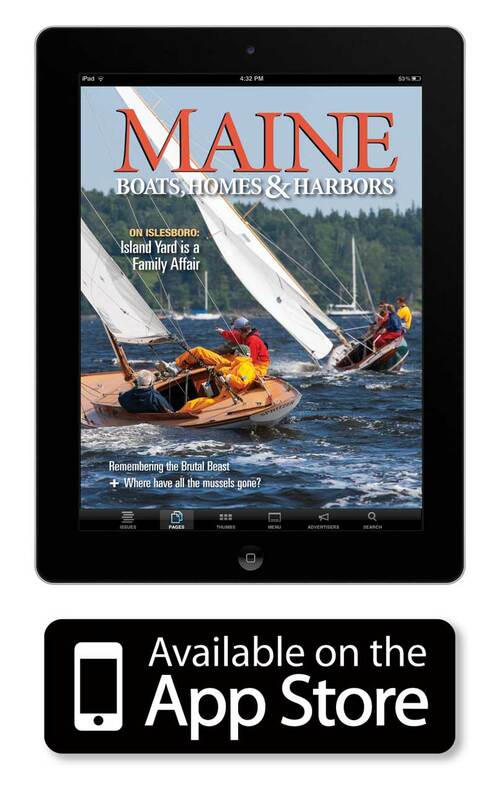 Q: How do I get the Maine Boats, Homes & Harbors digital edition onto my device? A: Download the MBH&H app from iTunes or the Google Play Store (it's free)! Once you install the MBH&H app, you can choose which issue to download and view. Subscribers will have access to the current digital edition as well as all back issues available. Q: What devices can I download the issues to? A: You can download the Maine Boats, Homes & Harbors digital edition to any smartphone or tablet that supports iOS or Android. Maine Boats, Homes & Harbors can also be viewed on any desktop or laptop with internet connection. Q: Do I have to be online to read the digital edition of Maine Boats, Homes & Harbors? A: Readers who download the app to their tablet or smartphone can save each issue within the app for offline viewing. Readers who are viewing the issue on their desktop or laptop must be connected to the internet to view the issue. Q: What if I want to update or change my email address (or) What if I never gave you an email address? A: For the fastest service, please email digital services with your new email address. Please be sure to include your name and current mailing address. Q: How long will my digital subscription last? A: Subscription lengths vary. To check your subscription status, please email us or call our toll-free subscription service at 1-800-710-9368 (M-F, 9 am to 5 pm). Q: I'm already a print subscriber, how can I get access to the digital edition? A: First, visit iTunes or the Google Play Store and download the app. Next, select the issue you'd like to download. When you're prompted to enter a username, please enter the email address you gave us. Your password is your account number. You can also view the digital edition on your desktop or laptop. Q: I'm already a print subscriber; do I have to pay to get access to the digital edition? A: Subscribers to the print magazine have access to the digital edition as part of their paid subscription, but will need to log in to view it. Q: I'm a subscriber and I'm entering my email and account number in the app, but it says it's going to charge me. Why is this happening? In iTunes: click on the lock icon in the top right corner to access the sign in page. Use your email address and account number as your username and password. In Google Play: select "Subscribe" and then select the option "For Current Subscribers" or "Already a subscriber? Activate your account." Q: I'm entering my email address and account number, but I still can't seem to log in. Why doesn't it work? A: First, make sure you are using the email address that we have registered in our system. Second, make sure you are using the right account number. If you're unsure of either, please email us or call our toll-free subscription service at 1-800-710-9368. Q: Can I get back issues digitally? A: Issues published on or after November 2013 are currently available digitally. We hope to make more back issues available at a later date. Q: What if I still have questions about my subscription or the digital magazine? A: If you still have questions regarding your subscription or the digital issue, please contact us. Q: I purchased my subscription through iTunes; what is my username and password? A: Your username and password were created during the iTunes order process. Should you forget your login, please contact iTunes or visit their support pages here or here. Q: What if I did not set up a username or password when I ordered? A: Please click on the 'restore' button on the order page to restore the purchase to your iPhone/iPad. Q: How long does my iTunes digital subscription last? A: If you subscribe through iTunes, your subscription is for one year (6 issues plus a bonus "Boats of the Year" issue) for $24.99. The subscription renews automatically unless you cancel your subscription. You can confirm your iTunes subscription status through iTunes subscription management or turn off auto-renew through your iTunes account settings. Q: How can I cancel my iTunes subscription? A: When you subscribe through the MBHH app in iTunes, your subscription will auto-renew unless you change your subscription settings at least 24 hours prior to the subscription running out. You can turn off auto-renewal at any time from your iTunes account settings. No cancellation/refund of the current subscription is allowed during an active subscription. Q: The issue is not loading correctly in my iPad/iPhone app; what can I do? A: Try cleaning your issue data (see instructions below). If that doesn't work, please email us. Find the issue your would like to read and download it again. A: If you purchased your subscription through Google Play, your username and password were created during the order process. Should you forget your login, please see the 'Help' section in the Google Play app on your device. You can also visit https://support.google.com/googleplay, or visit the Google Play support pages here or here. A: Please email us at for assistance. Q: How long does my Google Play digital magazine subscription last? A: If you subscribe through Google Play, your subscription is for one year (6 issues plus a bonus "Boats of the Year" issue) for $29.49. The subscription renews automatically unless you cancel your subscription. You can confirm your subscription status through Google Wallet. Q: How can I cancel my Google Play digital magazine subscription? A: When you subscribe through the MBH app in Google Play, your subscription will auto-renew unless you change your subscription settings at least 24 hours prior to the subscription running out. You can cancel your subscription at any time, however, canceling a subscription will not retroactively refund subscription payments, and previously charged subscription fees cannot be prorated based on cancellation date. For example: If you purchased a one-year subscription on January 1 for $29.49 and then cancelled your subscription on July 1, your subscription will remain active until December 31 and you will be charged the full $29.49. You will continue to get new issues from July through December and will have access to those issues after your subscription has ended. You will not be charged another annual subscription of $29.49. once the magazine opens in the play store, select "Cancel," then confirm. Q: The issue is not loading correctly in my app; what can I do? Under "Device", select Apps or App Manager (depending your device, this may be different). Touch "Clear Data" or (if that doesn't work) "Force Stop." Open your device's All apps menu. Select the app you used to make your in-app purchase. Check if your item has been delivered. If that doesn't work, please email us. For more answers to Google Play questions, visit https://support.google.com/googleplay. Q: What is BOATS OF THE YEAR? A: Boats of the Year is a print and digital supplement of Maine Boats, Homes & Harbors Magazine, highlighting boatbuilders, marinas, and services along the coast. Boats of the Year includes not only stories from the yards, but also feature articles by professional writers and photographers. Boats of the Year provides an interactive account of the work being done by some of the country’s finest boat builders, boat yards and others — all told in their own words and illustrated with gorgeous photographs. Q: Where can I get BOATS OF THE YEAR? A: Subscribers to the Maine Boats, Homes & Harbors magazine can view Boats of the Year through the MBHH app. Boats of the Year is also available for download through the Boats of the Year App. Click here for more information.